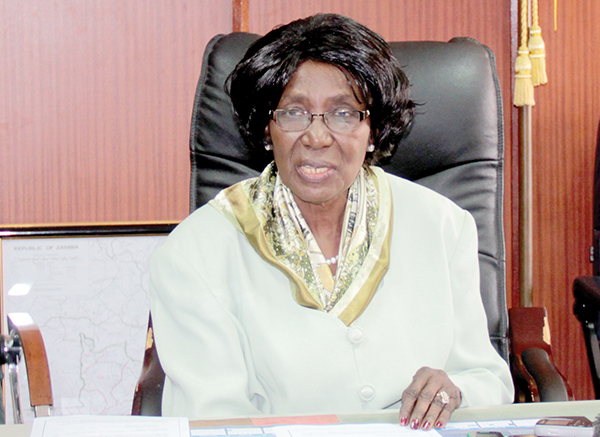 Vice President, Inonge Wina has called on the Barotse Royal Establishment to invite investors in Western province. Mrs Wina says government will only create a conducive environment for investors to operate in the country, but will not establish businesses. She has noted that there is a delink between the BRE and government. This is because the BRE is not advising government on matters of development in the province. Mrs Wina has explained that President Edgar Lungu would like to see the Kuta more involved in the development of the province, through giving advice. She says the Patriotic Front -PF- has taken note of the voting pattern and has since looked at the issues leading to the scenario. Ruth Kamwi reports that The Vice President was speaking today in Mongu, Western province, when she met the Kuta at Limulunga palace. Mrs. Wina has also said she has learnt the demise of Induna Kalonga, whose death she described as a loss for the entire country, as he was one of the hardworking traditional leaders. And Acting Induna Natamoyo welcome the Vice President to the province. Welcome boma Inonge Wina, daughter of the soil. May your words of wisdom fall on the ears that appreciate development in this part of our country. A long time ago I used to blame GRZ for not developing Western but I discovered that these pipo only boast of being most educated but are controlled by the most illiterate indunas in Zambia and their so called chiefs or king has no control over the welfare of the chief dom, these pipo are inferior and I wonder why youths in these chiefdoms are not rising against these illiterate indunas their provincial capital Mongu can’t even compare to Chibolia pit latrines in town if I rule this country I would give them their sand and rule themselves into poverty. They prevent development in their poverty habitat. Please disappointed avoid disappointing others and keep silent where you have know knowledge. If you were a true Zambian who knows Zambia’s history well you would not have opened your mouth unwisely like this!! I pit you my brother and my sister Inonge Wina for defiance and illiteracy in matters of Barotseland. Only time will tell. Please disappointed avoid disappointing others and keep silent where you have no know knowledge. If you were a true Zambian who knows Zambia’s history well you would not have opened your mouth unwisely like this!! I pit you my brother and my sister Inonge Wina for defiance and illiteracy in matters of Barotseland. Only time will tell. Please disappointed avoid disappointing others and keep silent where you have no knowledge. If you were a true Zambian who knows Zambia’s history well you would not have opened your mouth unwisely like this!! I pit you my brother and my sister Inonge Wina for defiance and illiteracy in matters of Barotseland. Only time will tell. @Ineta, Disappointed is spot on.All land belongs to BRE.Find out what happened to the council houses in Limulunga,the University that was to be built in Mongu.The Indunas are the ones that are causing under development in western province.They dont advise the Litunga properly….I dont blame govt at all. One of the main challenges in establishing capital intensive projects in Barotseland is the lack of bankable land ownership. Most land is under the BRE who can only lend it to you for a short period of time.Title deeds or land certificates could attract lending institutions to support small scale farmers to improve their farming skills which include sustainable methods of Fishing,Farming,Ranching and Forestry to name be a few. The BRE must wake up to act on this constructive criticism by moving with times.Educated and outspoken Indunas are sidelined for myopic ones and this has led to investors taking their capital else where. Mungu looks like an abandoned war zone with the youth merely engaging in antisocial vices like beer drinking nibu Hule.GRZ promises only come at Election time. Excellent… Western Province is as much part of Zambia as Eastern Province, North Western or Luapula… we need development there and can the leadership please facilitate this process, our brothers and sisters are suffering. Traditional leaders must be held to account – do not hold the people of Western Province captive, attract investors. bwana ‘dissapointed’, you seem to imply that the state in which mongu is has nothing to do with negligence from lusaka government. this is a lie never to be realised. there is genuine and recorded proof of how kaunda ensured that barotseland remains marginalized. but it is not important now, except in noting that it has effect on the stance barotsland has taken towards self rule. it is scathing evidence. i urge that, while this is the state of affairs, there is still chance that zambia can go on as one nation, but it has to take humility from people like you. you talk of sand, even in saudi arabia there is sand. so this should not bother you. even in cb there is copper. no land is desolate my friend.